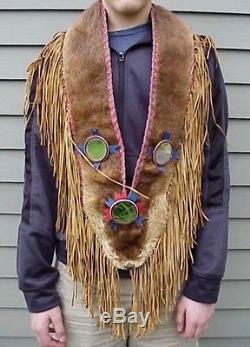 Rare GREAT LAKES-WOODLANDS OTTER HIDE SASH w FRINGE & TRADE MIRRORS, c. This is a rare large frontal sash made from an otter hide complete with the head intact and decorated with long fringes and 4 small trade mirrors, circa 1900 to 1925, or so. It is most likely Great Lakes in origin but could also be Woodlands Indian. Sash is 25 long from the shoulder to the nose of the otter at the bottom, plus another 7 for the fringe, and it is about 4 wide all around. It is lined with a red printed cotton fabric similar to seed sack fabric, and this fabric shows definite wear, discoloration, and fading. The mirrors are 2 1/4 in diameter in the front and 1 3/4 in diameter at the back, and they have both red and blue cut ribbon decorations. These are all held on with a piece of rawhide (shown in photo #9). The red cotton cloth appears to be sewn on at the edges with a gut material similar to a dental floss, and it is hard to tell if this is the first fabric backing. The hide is in nice clean condition with all of the hair intact, but there is a bit of a tear at the back of the neck that could use a little attention (last 2 photos). The fringes are in excellent condition and still very supple with only a very few missing all around. This was recently found in Maine. _gsrx_vers_625 GS 6.9.7 (625). The item "Rare GREAT LAKES-WOODLANDS OTTER HIDE SASH w FRINGE & TRADE MIRRORS, c.
1900-25s" is in sale since Sunday, May 08, 2016. This item is in the category "Collectibles\Cultures & Ethnicities\Native American\ US\1800-1934\Clothing & Moccasins". The seller is "imfishing" and is located in Lunenburg, Massachusetts. This item can be shipped worldwide.